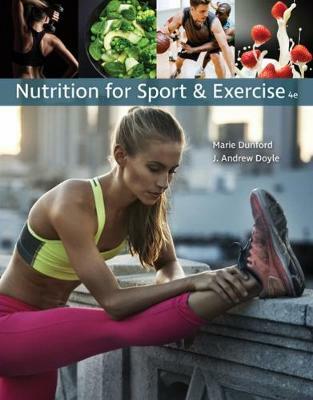 Teaching you how to interpret and apply scientific data, Dunford/Doyle's NUTRITION FOR SPORT AND EXERCISE, 4th Edition, emphasizes the scientific basis for sports nutrition recommendations and highlights current research studies of trained athletes. The text helps you translate current nutrition recommendations and guidelines into specific plans for the appropriate amount and type of foods, beverages and/or supplements to support training, performance and recovery--for a variety of sports. Detailed explanations of the connection between exercise and nutrition help you reach the ultimate goals--optimal performance and health. Giving you in-depth insight, entire chapters are devoted to diet planning, disordered eating and exercise patterns in athletes and lifelong fitness and health. In addition, MindTap Nutrition offers a wealth of digital resources to help maximize your study time.